For a long time the Philippines has been regarded as the paradise of learning English in Asia. English has become one of the two main languages here since 1935 and is widely used on more than 7,000 islands of this country. The education system in the Philippines is comparable to the United States, and English programs are based on American curricula. Taking an English course in this beautiful island nation will be a great option for those wishing to improve their foreign language. One of the leading English language schools in the Philippines is the Smile Means Everything (SMEAG), which can accommodate up to 1,000 students. The SMEAG English Language Institute has three campuses in Cebu and one campus in Clark. Each facility has a specialized training program, along with a convenient management system and facilities, which will facilitate students' learning. Established in 2006, SMEAG now has more than 800 teachers from English speaking countries such as England, USA, Australia and the Philippines. All of our teachers have extensive teaching experience and are regularly trained to improve their qualifications. - The SMEAG Training Center System is the IELTS Testing Center and Resource Center certified by the British Council and the only GAC Teaching Center in the Philippines. 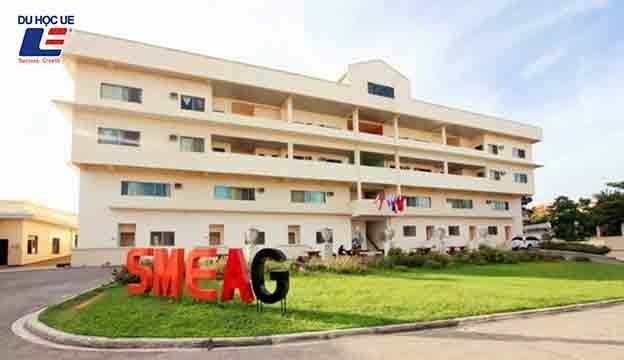 - SMEAG Philippines has four campuses located in the most crowded island cities. Capacity up to 1,000 students and 800 lecturers. Especially attracted more than 4000 trainees per year. - International students come from all over the world, including many Asian countries such as China, Japan, Vietnam and Taiwan. SMEAG believes that this diversity is a good environment to increase. Improve social skills and language skills for your students. - The SMEAG English Language Institute guarantees a 98% success rate for students. Weekly, SMEAG students are tested on IELTS, CAMBRIDGE, TOEIC, BULATS at the exam room on campus. This is also the place where the official examination of the above exam, giving you the opportunity to scrutinize, practice with the exam seriously. - Teachers have to undergo a rigorous selection process consisting of 7 steps, then they have to undergo 3 months of intensive training. Regular teacher evaluations and workshops are conducted to ensure that they provide the best and most effective teaching methods for students. - SMEAG English Language Center cooperates with many universities and offers training programs for students who want to study in USA, Australia, Canada, UK, Singapore, and many other countries. 1. SMEAG is the first private educational institution designated as the IELTS Testing Center of the British Council (recognized in July 2011). There is an IELTS Resource Center with the most learning space. SMEAG Phillipines is the Official TOEIC L / R Examination Site, and the TOEIC S / W is accredited by ETS in the Philippines (recognized in July 2012). SMEAG students and local contestants can take the official IELTS exam at SMEAG - Capital. GAC students can receive up to 39 college credits for undergraduate degrees including English, Mathematics, Social Studies, and more. Cambridge ESOL's first official exam was held in May 2013. Starting from here, students can take the Cambridge exam and the Cambridge exam at SMEAG. Cambridge ESOL is an affiliated institution of the University of Cambridge, offering internationally recognized qualification in English for English learners. This is one of the most famous English certificates and is provided by ESL teaching staff in the world. Each campus of SMEAG Philippines has a specialized training program, which has its own administration system. - Campus Classic: The Ielts Examination Center and Ielts Resource Center are accredited by the British Council. - Campus Captal: The Toeic and Toefl Examination Center is accredited by ETS, with a variety of facilities, facilities for study. - Sparta Campus: The only authorized Cambridge exam venue and venue in the Philippines.